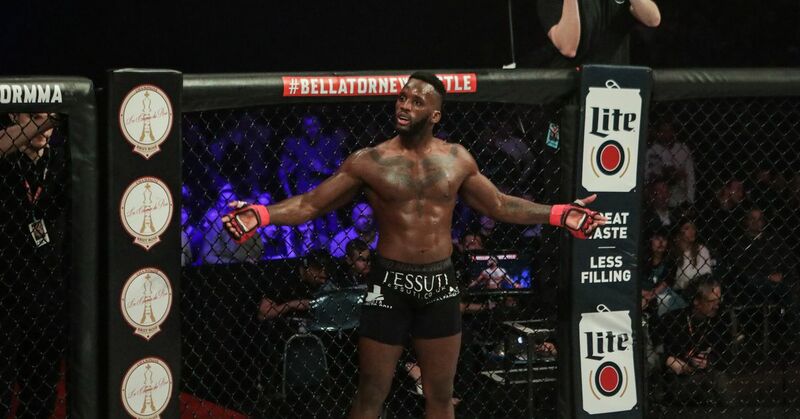 Fabian Edwards has been one of the most highly touted prospects in the U.K. ever since he made his professional debut, but that didn’t make his ascent to prominence under the Bellator banner a cakewalk by any means. Edwards got his new Bellator contract underway with a resounding decision win over former Cage Warriors champion Lee Chadwick in Newcastle last weekend. “The Assassin” has previously described his new Bellator deal as “life changing”, but he admitted that up until that point he struggled to make ends meet like most up-and-coming fighters. “It’s very hard,” Edwards admitted on the latest episode of Eurobash. “Every fighter knows that the come up is hard. Luckily I had a lot of people around me that told me to stay focused and that it would pay off. Edwards woke up every morning and cleaned to make ends meet and stressed that he didn’t mind doing it because he knew he was set for bigger things in the future. When given an ultimatum by his employer and forced to choose between MMA and his cleaning work, Edwards chose to part ways with his everyday commitment ahead of his last outing under the BAMMA banner last May. “They had to let me go because I kept needing to take time off. When I had a fight coming up I’d have to have about four or five days off, and they were like, ‘Mate, you’re going to have to choose [between the cleaning job and fighting career],’ and I was like, ‘F*ck that’. I think it was before my May fight in Dublin, I had to pack it in then. Honestly, if they hadn’t given me that option I’d probably still be there, I’d have kept earning money right up until that Bellator deal,” he said. Check out the latest episode of Eurobash. The Fabian Edwards interview beings at 38:00.